One of the most fun and challenging projects for any homeowner or trade pro to take on is a bathroom remodel. With the products and materials offered by ProSource® of Lee’s Summit, your bathroom will look better than ever. 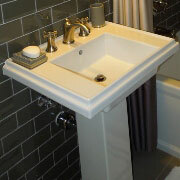 Enjoy luxurious new sinks, faucets, tubs, and showers, as well as the value it adds to your home. The bathroom sink sets the tone for the entire bathroom. When starting a bathroom remodel, we suggest keeping this vital piece in mind. We have under-counter, pedestal mounted, and above-counter options to brighten any bathroom. Modern bathroom faucets are offered in a nearly endless litany of sizes, shapes, finishes, and capacities. 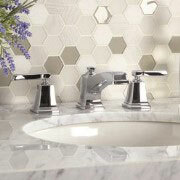 An elegant new faucet is the perfect compliment to your new sink and adds visual appeal to your bathroom. Wash away the concerns of the day, or start with a clean slate in the morning every time you take a shower. At ProSource of Lee’s Summit, we offer a complete line of shower handles, heads, doors, and accessories that make your shower more enticing than ever. Pair your new sink with a gorgeous new vanity. Not only are they attractive, but they’re practical, providing you and your homeowner clients with valuable storage space in the bathroom. 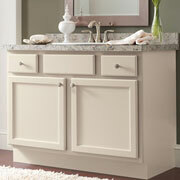 Adding a vanity during the remodeling process is a great way to add a refined touch to any bathroom. 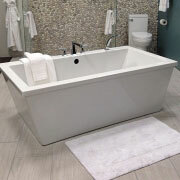 Settle in for a nice soak in a new stone tub for your bathroom. Whether you’re looking for a practical fiberglass example, or a luxury marble fixture, your bathroom will look better for having a new tub from ProSource in it. We spend more time on the toilet than we perhaps like to admit, so taking some time to find the right toilet for your bathroom remodeling project is always a good idea. Work with the bathroom specialists at ProSource! 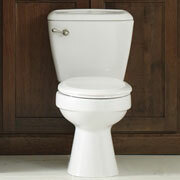 You can find toilets that fit your bathroom’s decor and style, and are eco-friendly too!